Finding the perfect roofing contractor in Beaverton doesn’t have to be difficult. Pioneer Roofers, we have been Beaverton’s roofing contractor of choice for more than 20 years because we provide high quality, timely, and customer oriented work. Roofing is a business for those with a passion for craftsmanship, who know the value of creating something that may outlive themselves; and, providing their community with the best they have to offer, every single day. We pride ourselves on quality work and back it up with exceptional warranties. We live, work, and use the same buildings we provide roofing services to. Supplying the surrounding area with the best roofing services is about ensuring a prosperous community, by providing citizens with roofs they can be confident will protect them year after year. You should never have to worry about the quality of the construction of your roof, materials, or longevity. With us as your Beaverton area roofing contractor, you won’t have to. As premier roofing contractor in the Beaverton area, we’ve supplied many local businesses with exceptional roof repairs. Extensive training and continual education regarding techniques, structural guidelines, and new advancements in roofing allows us to produce work that meets any need. These include energy efficient techniques that can actually save your business money by reducing heating and cooling costs. Our job as your roof contractor doesn’t just end when the job is over either. In addition to using materials of the highest quality, we guarantee the work we do. That’s because every employee we bring into the Pioneer Roofers family is a dedicated individual at the height of their craft. We make sure they know that every job demands excellence, and seek individuals who continue to provide outstanding craftsmanship job after job. 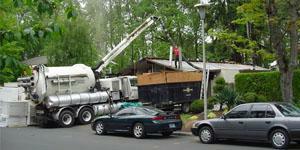 Our quality and drive to be the best roofing company in Beaverton doesn’t stop with the commercial sector. We offer all of the same wonderful services to our residential roofing customers as well. We know you want a roof you can trust, built with quality construction and solid materials. Customization is also key in many of these projects, and we can design and build the perfect roof for you whether you need a sloped roof, flat roof, or gorgeous workable garden roof. For an honest roofing contractor in Beaverton that provides the highest quality work, call (503) 281-0305 or contact us today. Beaverton is so much more than just a Portland sleeper town. Though it does supply easy access to the greater metropolitan area, Beaverton has a number of fantastic benefits for residents. With a great school system, and local library, residents with families will find much to enjoy. The library even has a number of great classes geared towards adults like computer classes. Children can enjoy story time while their parents learn new skills. Those looking for outdoor excitement Beaverton shouldn’t miss out on the Friday Farmer’s Market. This Beaverton staple has been providing residents and visitors with an excellent place to pick up some locally produced, organic produce, flowers, and other goods since 1988.